After weeks of preparation and training Emily Davies, Tegan Wilcock and Lola Ernstzen competed in their first competition together as a new partnership. 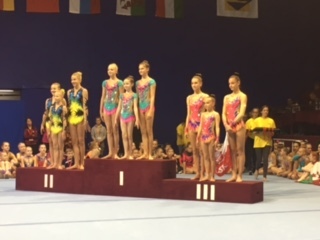 Although the girls train alongside some of the clubs most elite gymnasts, having an international competition as their introduction to the acrobatics community wasn’t an easy experience and the girls got through it seamlessly. The Budapest Acro Cup was the first time Hungary have ran an international acrobatics competition and the girls lead from day one. Fighting off some tough challengers they made it to the gold medal winning position without question and had a brilliant experience to prepare them for a future of acrobatic success. Congratulations again to Emily, Tegan and Lola! May it be a sign of things to come!